Bunched up car mats can jam the pedals when you least expect it and lead to a serious accident or death. Major recalls by Toyota, Lexus, Ford, Subaru, Mazda, Mercedes-Benz and Maserati in recent years were prompted by the very real danger of unintended acceleration caused by pedal entrapment from skidding driver side floor mats. Will your floor mat move if you kick it hard during emergency braking? Find peace of mind – Eagle Klaw fasteners can protect you and your loved ones. Many cars have nothing to hold the mats still. Others use, sometimes difficult to install, hooks, clamps or Velcro pads, which often fall apart or break off. Regardless of the type of fastener, most car owners agree – they don’t work well. Why? Because it’s not only about how fasteners connect to the floor mat; it is also about how securely they stay in the car floor under the mat. Very easy to install, minimally intrusive, Eagle Klaw anchors penetrate the carpet at 5 points and are tension mounted, preventing movement of any kind. With Eagle Klaw fasteners you will not have to adjust the floor mats ever again, even the always messed up rear ones. Eagle Klaw will protect the value of your car by allowing floor mats in the front and back to do what they were designed for – keep dirt, mud, water, grease from permanently staining your car’s flooring. The low profile cap with partially threaded post and sliding washer accommodate different car mat thickness and material. Eagle Klaw car mat clips can be used with original (OEM), all-weather or aftermarket floor mats such as Weathertech; with or without pre-installed grommets. Now you can make sure your new-car floor stays new-car clean, nice and neat. When you step on the cap or hit it with a hammer, the anchor bends inward and the spikes penetrate the carpet on a slight outward angle. When released, the fastener springs back flat and the spikes return to a vertical position, gripping the carpet. The five-legged design provides optimal force distribution and ensures that all spikes are inserted at the same time. The fastener doesn’t move if you push the mat hard in any direction. It is also very difficult to remove the anchor by hand. You need to apply a significant force using a flat screwdriver to lift the spikes out of the carpet. 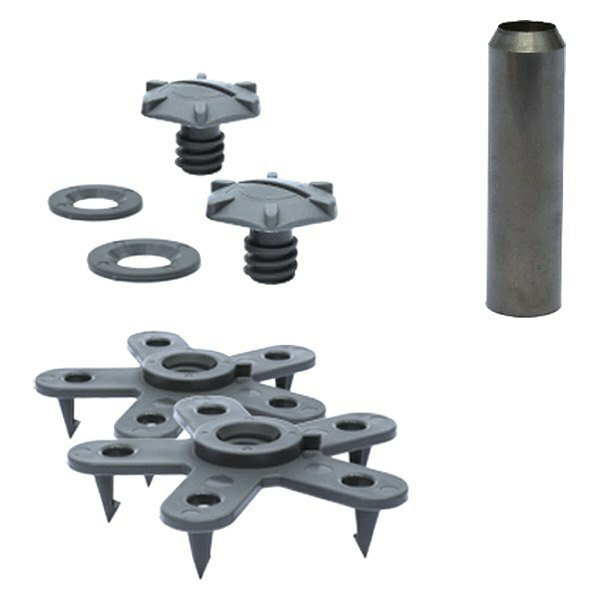 The cap, with a 1/2″ long, partially threaded post, is designed to work with any common mat thickness or pre-installed grommet height. Its 3/8″ post diameter fits most factory installed mat grommets or holes made with a 3/8″ hole cutter. If a mat is thin, the end of the cap post can extend below the bottom of the anchor to keep as low profile as possible without compromising the fastening strength. The anchor has a thread-finding recessed area to make it easier to screw the cap into the anchor. Tightened with or without the sliding washer, the cap prevents or minimizes the possibility of water getting through the hole. To remove mats for cleaning, unscrew the cap with your fingers, coin, flat screwdriver or 7/8″ socket. The sliding washer moves along the unthreaded portion of the cap post to accommodate different mat thicknesses. When the cap is screwed in and tightened, the sliding washer is pushed up against the mat by the elevated portion of the anchor. The washer loosens, but stays on the cap when it is unscrewed. The sliding washer doesn’t have to be used with hard car floor liners made from rubber or plastic if they are too thick. It’s also not needed for mats with pre-installed grommets. In an unlikely event that a new anchor needs to be installed in the same place, it can be easily done by rotating the anchor and inserting spikes into the new spots. This is impossible to do with fasteners attached to the carpet at a single-point.